The Pipeliner delivers unmatched corduroy carving performance. This is the board for classic surf-style snowboarding. A piste and powder pistol for riders who like deep, high-speed turns. With 1501 mm of effective edge you can ride the steeps with total confidence. The longboard shape provides superior edge hold and the rockered nose and tail make it a high-performance powder gun. This versatility is at the core of our design philosophy. The topsheet design is inspired by surf maverick Miki Dora’s “Da Cat” board. It’s easy to shape for hero conditions with no crust or ice, but the perfect days are too few to depend on. We construct boards you can trust even in critical situations. 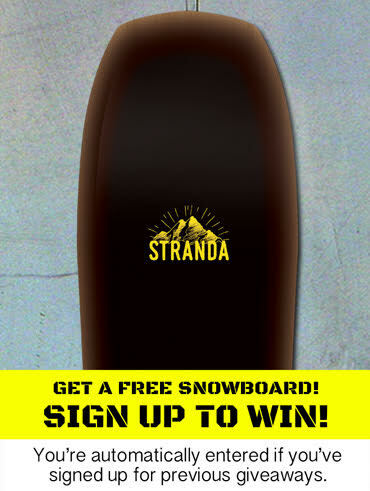 A Stranda longboard is built using proven technologies and inspired by riding in the most diverse terrain. We use sophisticated sandwich constructions that create new performance standards for powder and groomers. At Stranda Snowboards we use ash wood and a minor part poplar in our cores. Ash is perfect for building high-performance snowboards as it dampens vibrations and holds its camber, extending the life of your board. Adding poplar keeps the weight down. Choosing a premium material also allowed us to reduce the use of petroleum-based composites. We use a thin layer of bamboo as the topsheet, which adds to performance. We build our snowboards with classic camber and distinguish between standard camber and low camber: The Pipeliner has standard camber with Tip-Tail-Rocker. The camber is elevated 11mm, with the contact points slightly moved toward the snowboard’s centre for easy turning. The board feels very stable, even when carving on icy slopes. Progressive rise in the nose optimizes float and easy turning when freeriding. Combined with Tip-Tail-Rocker and a shorter tail it results in forgiving, playful performance. With a 50 mm setback and a shorter tail, you can ride powder with ease. I started snowboarding and skateboarding in the the early 80’s because I was a landlocked surfer and all my moves were inspired by what I saw in the surf mags and Thrasher mag. Big slashes, carves, board slides, cutbacks, speed and grinds, this is what motivated me to ride. In the early 90’s the great big snowboards with freestyle and surf style carving, all mountain shapes drew me in–the Lib Tech Grocer 188cm, the K2 Eldorado 177cm. These were Big boards that could do huge high speed carves through all kinds of conditions and still you could throw them around like a freestyle board, hold an edge on icy steeps and float like a dream on powder. The PIPELINER is that style of board and has brought that all back to snowboarding and brought it up to the next level. There was a void for big longboard surf style snowboards for so long and I give Mats major props for his surf inspired spirit and bringing this type of riding and mentality back to the sport! He knew there were many others out there craving to carve in style again and own the powder like no other. The PIPELINER has really improved my carving game and has been a pleasure to ride in all conditions, even mowing down heavy duty crud at high speed. Fast, stable, powerful, big turning radius but highly responsive from the waist and no going over the nose, the PIPELINER is a really well made, incredibly fun board to ride! Cheers to Mats Drougge and Stranda! Keep the boards coming! I recently I upgraded to their new board, the Pipeliner. Having a great time on it, and thought I’d share videos from the first two days on it. I’m riding 45F 25R angles in Salomon Malamutes and getting plenty of support. The board is responsive and very good at holding the edge. The board is long and has plenty of edge, but at the same time it’s flexible and the ride feels very surfy. latest news and offers from us.